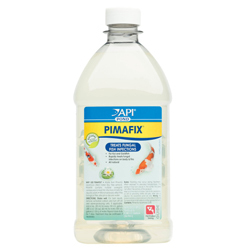 API Pond Pimafix contains an all-natural formula that rapidly treats fungal infections on the body and fins of your pond fish, in addition to treating internal and external bacterial infections. This product can be used in combination with Pond Melafix to enhance effectiveness against certain fish diseases. For best results remove activated carbon and turn off UV and ozone-producing units during treatment. Add 2 tsp. for every 50 gallons of water, or 1/4 cup for every 300 gallons of water. Dose daily for 7 days. Treatment may be continued if necessary. Foaming may occur during the treatment. When exposed to elevated temperatures, this product may turn cloudy in the bottle; this does not affect the activity of the product. WARNING: This product can expose you to chemicals including beta-Myrcene, which is known to the State of California to cause cancer. For more information go to www.P65Warnings.ca.gov.